Happy Saturday friends!! Actually, it's Cinco de Mayo today...so HAPPY CINCO DE MAYO! I truly apologize for the lack of blog love this week! I blame it all on this stupid wisdom teeth surgery recovery. That's totally a good enough excuse for me. Holy cow it's been a hard one! My husband and I had NO IDEA things would be this hard or last this long. I kid not, I was all about Cinco de Mayo weekend...thinking we'd have a nice "can finally eat solid foods Mexican food celebration date" followed by possibly seeing The Avengers...Sadly, I don't really see that happening. To give you just a small feeling for what I mean- Thursday was almost hospital time. 'Nuff said. BUT I didn't end up going, have spent the remainder of the week bundled up on the couch snuggling my two lovey kitties, and drinking more smoothies and pureed substances than I care to discuss right now. Haha. I will say though- aside from some pain in my mouth and a tiny nausea feeling in my stomach- I feel pretty good today. I also haven't gotten off the couch that much...but still. Total improvement! Before I had surgery, I needed to liven up my water drinking. I was at the point where I felt like some days I drank so much water I would drown. Let's be honest for a second...water...is boring. Like majorly boring. I get it- it's good for you, it hydrates better than any other fluid out there, flushes out toxins, hydrates skin, etc etc. I know this- that is why I drink so much of the darn stuff! I never leave home without one of our many reusable water bottles, drinking away my life (in water form) all day every day. I've actually gotten to the point that if I hop in a car without a water bottle...I feel naked. It's the weirdest thing. Chapstick and water- a girl can't leave home without it! Well...and clothes. But that doesn't mean it's not...boring. Dangit. I did it again...interruption central over here!! Water! Come on Christina, focus. Water, water, watery water things with water and such. I had some left over fresh ginger from a previous recipe I had made, so I decided it was going to go into a "tea" that I would make a big batch of with other "good for you" things, keep in the fridge, and drink till my heart's content! It was pretty content. This stuff was amazzzzzing. Not "zzzz" as in boring sleepy time either... "zzzzzz" like REALLY EMPHASIZING the AMAZINGINGNESS of it. Ginger- great for digestion and settling an upset stomach. Cinnamon- great for controlling blood sugar. Green Tea- good for getting yer antioxidants and has some anti-inflammatory qualities to it. Feel free to drink hot, or make into a sort of "iced tea" like we did. It's seriously amazing as an iced tea. I can see this made in a large batch and served as a great non-alcoholic beverage for your upcoming Cinco De Mayo party or picnic ;) Especially if you sit outside and drink it with pink (or any colored, really) stripey straws. I promise. This couldn't be easier to make! Take a medium sized saucepot, fill with 2 quarts of filtered water and place over medium-high heat. To the water add: ginger, cinnamon stick, star anise pods, insides of a green tea bag, and the zest of one orange. Bring to a boil. Then take off heat and steep 15-20 minutes. Pour through a fine mesh sieve into a jug. Either serve warm, or do like we did and chill. Sweeten lightly with some raw honey, should you want. It's fantastic poured over ice! 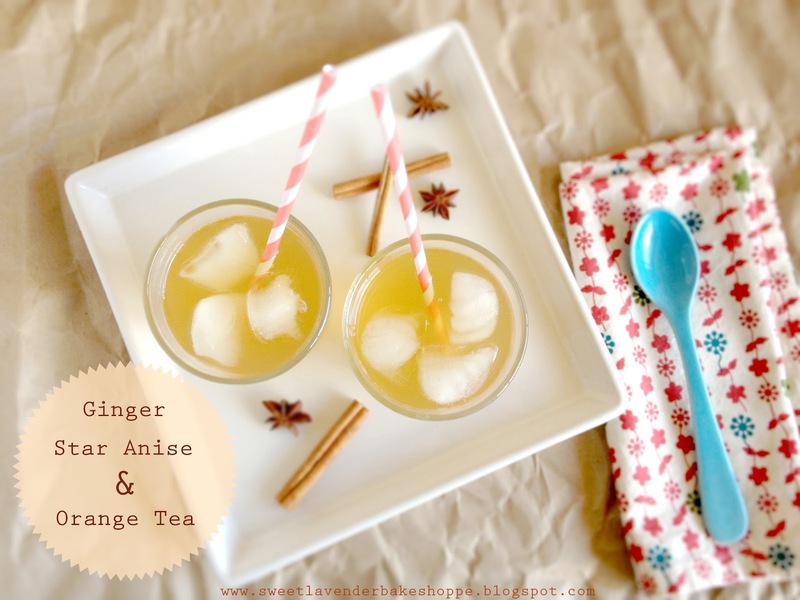 I heart anything with ginger! I lived on ginger when I was pregnant... works so amazing for nausea! I will have to make this drink for sure.